Welcome to St. James and St. Ann’s Elementary School! We are a Christ-centered school that promotes the development of the whole child – spiritually, intellectually, emotionally, socially and physically. We offer a wide range of educational experiences. Our academic program follows the Redesigned BC Curriculum and our teachers maintain high, yet realistic expectations for their students. Our teachers are supportive of the diverse learning needs in their classrooms, and use instructional strategies that engage all learners. We have a strong staff that cares deeply about the children entrusted to them. We offer a wide variety of extracurricular activities, including clubs such as robotics and chess, as well as the art club and the Lego club, and many sports teams. All of our extracurricular activities seek to fulfill our mission to develop the whole child, have an inclusive philosophy and provide the children with an opportunity to connect with their peers while having fun. We are a community-orientated school, and encourage our parents to share their time and talents by volunteering at the school. This gives parents a way to connect to the school community, while making the school a better place for their child. In addition, we welcome parents to participate in the daily life of our school by attending school Masses, our assemblies and our fundraising events. 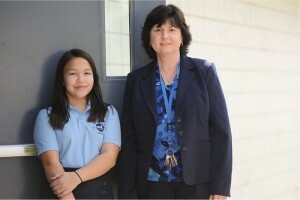 Our school is a vibrant place to be and we all look forward to seeing our parents. I welcome the opportunity to answer your questions or just to talk about the school that I am so proud to be a part of.